Volunteers of Operation Help a Hero and founders have been supporting Camp Pendleton Marines and Sailors since 2001. We did so BEFORE there were adoptive cities, BEFORE most military supporting organizations were created to support our military and their families, and we CREATED the projects we have in place based on needs we saw in the military community. We will CONTINUE to serve those who serve our country at home and abroad -- whether our country is at war OR NOT. We do not require our service members to be in a combat zone to know that their sacrifices are real no matter were they are sent to serve our country. We know they need to be prepared for anything when they train and deploy, and we need to be prepared to support them no matter what their deployment looks like. Operation Help A Hero (formerly known as Operation Sweet Dreams and/or St. Johns Marine Ministries) began as a grass roots Marine Ministries/ Pen Pal group shortly after September 11, 2001, when Cindy Farnum's Middle School students welcomed local Marines to the school for a Veteran's Day celebration. In 2002, those same students at St. John's Episcopal School decided to write to and support the Marines of First Battalion, Fifth Marines during their upcoming deployment. At that time, Mr. Farnum, a Marine, was preparing to deploy, and Cindy was the Key Volunteer Coordinator for 1/5 (2001-2004). By the end of December 2002/ January 2003, 1/5 began deploying to Kuwait and eventually led the push across the border into Iraq starting Operation Iraqi Freedom I. During this deployment, St. Johns students and families wrote and sent care packages to over 1,300 Marines in and attached to 1/5. The group also supported and collected items for 1/5's injured during the deployment and assisted in welcome home festivities (to include the barracks project pictured above) for the battalion, coordinating with the unit's Key Volunteers. The support of St. Johns was even mentioned in Chaplain Carey Cash's book A Table in the Presence. Cindy, because of the whole community's response to these efforts, was recognized in 2003 by California Governor Gray Davis for her efforts in support of local Marines, Sailors and families of the fallen. The following year, in early 2004, St. John's Marine Ministries and Pen Pal Group continued its relationship with 1/5 as they deployed yet another time to Iraq -- this time Fallujah. In addition, Cindy started efforts to support 3/5 and all of 5th Marines. Students and families continued to write letters, send care packages and support the Marines' families locally. When 1/5 and 29 Palm units lost many in during "Operation Vigilant Resolve", our organization rallied and collected $5,000 for every child of a fallen Marine in 1/5 AND four children who lost their father with 2/7 (out of 29 Palms). We began to host family events for Camp Pendleton units, whose hands are often tied when donations are needed. These events included help at Christmas parties, our first Operation Christmas Spirit, babysitting for KVN events, Fall Festivals, hosting a Spring Carnival at Lake O'Neil, a barracks project for 1/5's single Marines and throwing welcome home parties for returning units. This was also the year we began hosting baby showers for deployed units. In 2004, we began what would become an annual drive -- Operation Christmas Spirit. Started by Christy Wrightson, this drive collects toys, gifts, gift cards and cash donations to thank our local Marines and Sailors and fullfill their holiday wish lists. Since 2004, Operation Christmas Spirit has collected truckloads of Christmas items given to deployed units, ipods for Wounded Warriors and Balboa Hospital's Wounded in Action patients, and tons of items used at various Camp Pendleton Christmas parties. In addition, each year military families are asked to make Christmas wish lists and paired with other families, groups and businesses to make their wishes a reality. This program remained in action even when Mrs. Farnum moved to Quanitco for the 2004-2005 school year, keeping the efforts in tact while Cindy was away. With 5 years of service with the programs above, in 2007, we decided we wanted to share our mission of fostering learning through our newest project: Operation Bedtime Story. We video recorded Marines reading children's books for their children and/or wives. The videos were carefully burned to DVDs and shipped out to families as a nice suprise. Each video also came with the book read in the recording or a box of chocolates. Our guinea pigs were 1st CEB and 3/5, and the results were great! Since our efforts -- which began in 2001 and solidified in 2002-- were growing as were the requests of Camp Pendleton units, in December of 2009, we became a 501 (c) (3) non-profit charity. We spent years helping local military families with amazing volunteers and donors who gave out of the goodness of their hearts, but we realized that an official non-profit status would help us continue to support local families and be able to give (tax exemption for donations) in return. In the past 14 years, Operation Help A Hero volunteers/leaders have served Camp Pendleton, Yuma, 29 Palms, and Mirimar units, to include: The 11th MEU, 13th MEU, 15th MEU, 31st MEU, 1/5, 2/5, 3/5, 2/4, 1/1, 2/1, 3/1, 1/4, 1st LAR, 1st CEB, 1st Radio BN, 1st Recon, SOI West, CLB 5, the Wounded Warrior House, 3/4, 3/7, 2/7, HMLA 169, 7th ESB, 1st Recon, HMM 268, and Balboa Naval Hospital (San Diego). Our organization has grown beyond the grassroots ministry started in 2001 and now works with groups across the country to bring peace to our American patriots in uniform thanks to people like you! We ARE still a "mom and pop" organization in that we operate locally to ensure that every dollar or good donated goes to the men and women we serve, but make no mistake-- our projects and efforts are huge! Job Well Done and Thank You! 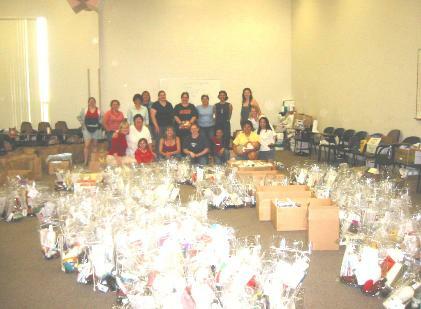 December 2009: Operation Christmas Spirit benefitting 40 Camp Pendleton families from 1/5, 2/5, 3/5, CLB 5 and the SOI. April 2010: Operation Rack Pack for 600 3/4 Marines who returned from deployment in Afghanistan. December 2012: Operation Christmas Spirit for 100 families, and assistance with 2/1, 3/1, 3/7 and 1/4 Christmas parties. September 2013: Operation Bedtime Stories Part I and II serving 75 children with deploying parents. THIS LIST CONTINUES UNDER THE "OHH THANK YOU" TAB... CLICK ON "MISSIONS ACCOMPLISHED"
In addition to the events sponsored and coordinated by OHH, our Operation Enduring Support Program for families in crisis was able to provide rent for a wounded warrior, aid to help move a family in crisis, funeral costs for a former Marine, financial assistance for families in serious need, ipads for wounded warriors, support for victims of fires, and furniture to well-deserving military families. OES has served military families in many other circumstances and situations. While we occasionally publish an alert with unit/family permission, most of the help/support we give is done quietly out of respect for the families we serve. Please consider donating to this program to help OHH have the resources to support our heroes in crisis. None of our projects, programs or efforts would be possible without your support. THANK YOU for showing our men and women in uniform that you appreciate their sacrifice, bravery and dedication; your efforts help our American military heroes to know they are not forgotten.